In an irrational attempt to sponsor inflation, the Swedish central bank, Riksbank, slashed interest rates to -0.35% and conducted several rounds of QE. Those misguided efforts failed to produce the desired 2% rate inflation, so the central bank now threatens currency intervention while drawing a line in the sand with the valuation of the Swedish Krona vs. the Euro. Bloomberg reports Sweden Seen Closer to Krona Intervention to Tame Exchange Rate. Some of Scandinavia’s biggest banks are warning investors not to underestimate the risk that the central bank is preparing to intervene in the currency market. Nordea and SEB both say the Riksbank won’t allow the krona to strengthen beyond 9 against the euro. It traded at 9.187 on Friday. The prediction follows a Dec. 30 warning from the central bank that it’s ready to act if persistent krona strength gets in the way of its 2 percent inflation target. With a benchmark interest rate already at an historic low of minus 0.35 percent and several rounds of bond purchases behind them, policy makers are under pressure to consider other measures to live up to their inflation mandate. Underlying inflation has been below the Riksbank’s target since the beginning of 2011 and headline price growth has hovered below zero for much of the past three years. Though Sweden has resorted to extreme policy measures, its negative rates and quantitative easing have been overshadowed by far more dramatic monetary stimulus programs from the European Central Bank. Against the euro, Sweden’s krona has strengthened about 4 percent over the past 12 months. “If the exchange rate strengthens earlier and more rapidly than forecast, it will be more difficult to push up inflation towards the target," Governor Stefan Ingves said on Dec. 30. "The Riksbank is therefore highly prepared to intervene on the exchange market whenever we deem it necessary." The comments pushed the krona off a nine-month high versus the euro. 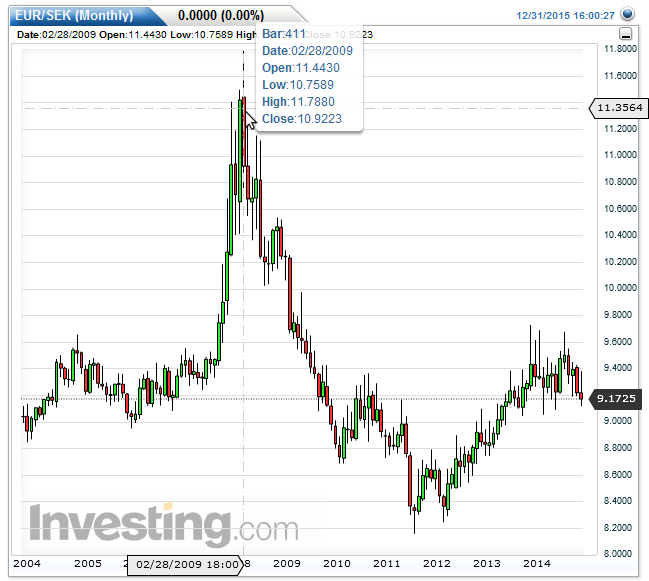 Since February 2009 the Krona strengthened from a high of 11.788 per Euro to 9.1725 to the Euro. That's an increase of 22%. Swedish shoppers are no doubt pleased to get more fore their money but the central bank isn't pleased at all. Why the panic? The Krona is right where it was between 2004 and 2008 before it weakened dramatically. Was 2009-2010 Nirvana for Sweden following that weakening? Brazil begged for inflation, got it in spades and now is very unhappy. Japan tried to hit an inflation target of 2% for decades and failed. In the process, Japan accumulated the highest debt-to-GDP ratio of any advanced country. Switzerland instituted a currency peg and unleashed massive volatility when it was forced to abandon the peg. Why does the Riksbank think it will succeed when nearly every currency intervention in history has failed? The answer is simple. Central bankers are trained, arrogant fools. They believe in all kinds of things the market has proven does not work. The simple fact of the matter is "Inflation Benefits the Wealthy" (At the Expense of Everyone Else) . Those who disagree can respond to my Challenge to Keynesians "Prove Rising Prices Provide an Overall Economic Benefit"